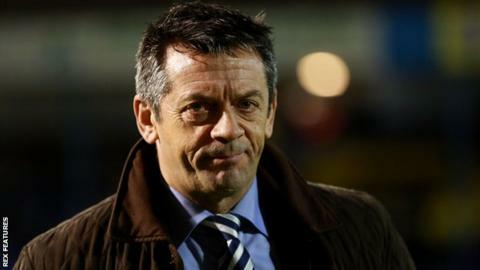 Southend boss Phil Brown has called for assistant referee Barry Gordon to be "struck off" for his role in awarding a penalty in Sunday's 3-2 loss to Bury. Ryan Lowe hit the winner after Sam McQueen was adjudged to have handled. "I'm not one for stopping people from working, but [the assistant] needs to be struck off," Brown told BBC Essex. "(Referee) Trevor Kettle didn't see a penalty, so why has he given it? Because his assistant has put his flag across his chest." Brown added: "That's an absolutely disgraceful decision. The 93rd minute of the last game of the season and he makes a decision like that. "The referee didn't see a handball so he should have taken control of the game. He's the man in charge, it's up to him whether he makes the decision, if it goes against the home team, it doesn't matter if it's the right decision. "He's gone with the [assistant referee]. How they can sleep at night is beyond me." The Football League told BBC Sport it is "aware of an incident involving Brown and assistant referee Gordon and it is now in the hands of the Football Association". Victory saw the Shakers end the season 14th in League One, one point and one place above their opponents, who lost their final five matches of the season. Brown continued: "Bury have gone above us, that's what's a disgrace about it. We are a better team than Bury and we showed that today. "We had numerous chances to win this game of football. Sam McQueen had a tap in that they cleared off the line, [David] Mooney's hit the bar, [David] Worrall's hit the post." Meanwhile, 20-year-old Southend midfielder Jack Bridge has signed a two-year contract extension after making two first-team appearances this season.